Considers Gilman's place in American literary and social history by examining her relationships to other prominent intellectuals of her era. 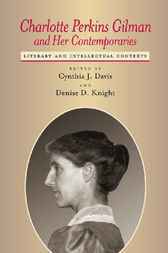 By placing Charlotte Perkins Gilman in the company of her contemporaries, this collection seeks to correct misunderstandings of the feminist writer and lecturer as an isolated radical. Gilman believed and preached that no life is ever led in isolation; indeed, the cornerstone of her philosophy was the idea that "humanity is a relation." Gilman's highly public and combative stances as a critic and social activist brought her into contact and conflict with many of the major thinkers and writers of the period, including Mary Austin, Margaret Sanger, Ambrose Bierce, Grace Ellery Channing, Lester Ward, Inez Haynes Gillmore, William Randolph Hearst, Karen Horney, William Dean Howells, Catharine Beecher, George Bernard Shaw, and Owen Wister. Gilman wrote on subjects as wide ranging as birth control, eugenics, race, women's rights and suffrage, psychology, Marxism, and literary aesthetics. Her many contributions to social, intellectual, and literary life at the turn of the 20th century raised the bar for future discourse, but at great personal and professional cost. Cynthia J. Davis is Associate Professor of English at the University of South Carolina and author of Bodily and Narrative Forms: The Influence of Medicine on American Literature, 1845-1915. Denise D. Knight is Professor of English at the State University of New York, Cortland, and author of Charlotte Perkins Gilman: A Study of the Short Fiction.